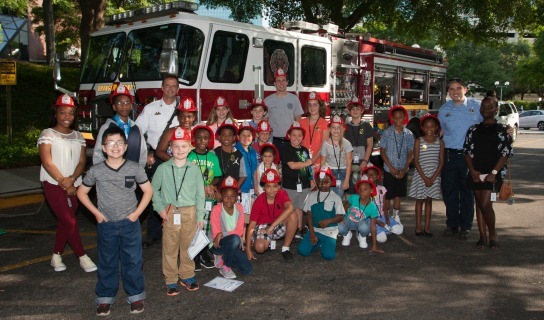 Orange County Government proudly participated in the national initiative, Take Our Daughters and Sons to Work Day, and hosted the children of more than 100 employees from a number of divisions and locations across the County on April 28. Following the morning activities held at various Orange County Government Divisions, including Utilities, Fire and Rescue, the Convention Center, Communications, Planning and more, children gathered in the Board of County Commissioners (BCC) chambers for a special mock BCC meeting. Orange County District 2 Commissioner Bryan Nelson welcomed participants and gave an overview of the local government process before introducing a video of Mayor Teresa Jacobs who thanked the children and employees for participating. The 30-minute, mock BCC hearing provided the children a firsthand look at how government impacts neighborhoods and local communities. Eight “kid” Orange County Commissioners sat at the dais and represented their respective districts. Children discussed the possibility of building a Major League Baseball stadium at the intersection of Sand Lake Road and Turkey Lake Road. Other children lined up at the speaker’s podium to give public comment in support of or against the development of the stadium. Coached by Orange County’s Planning and Neighborhood Preservation & Revitalization Division employees, children shared their complaints about noise, lights, traffic and the negative impact the development could have on native animals in the area. After listening to all of the presentations, the “commission” voted against the zoning change. Trinity Wood, 13, served as the District 4 “kid” Commissioner. “I didn’t realize how much pressure it is to work as a County Commissioner,” Wood said. Though Trinity worked well under pressure as a County Commissioner, she said local government probably would not be the career path she chooses. “I want to be an actress or a doctor when I grow up,” Wood said. Trinity’s father, Orange County employee Robert Wood, works in event operations at the Orange County Convention Center. He said was proud to see his daughter sitting at the dais. “This is a great way to teach kids the responsibility and hard work it takes to be a leader and to work in local government,” Wood said. Participants also received an overview of the artwork in the BCC Chambers, as well as a tour of the Chambers’ control room. The national Take Our Daughters and Sons to Work program, now in its 23rd year, demonstrates the value of education and provides a glimpse of the future in a hands-on environment. This year’s national theme, “Sparking Aha! Moments,” was created to inspire the youth of today to look towards tomorrow with excitement and vigor. A collection of photos from the Take Our Daughters and Sons to Work Day event is located on Flickr.